A movie that was clearly meant to be blade meets the matrix, only not quite as smart or fun as either of those. Underworld is a movie that thinks it can just mix a whole bunch of things together and get somewhere. and it nearly does. first off, it mixes vampires and werewolves. and it has them be mortal enemies, each a part of a huge underground organization. secondly, it tries to make a sort of romeo and juliet type story, where a vampire and werewolf fall for each other. of course, this is as close to romeo and juliet as the movie gets, since the werewolf isn’t really in either camp, and is just starting to find out about what he is. He isn’t a part of the werewolf crew, and instead, he’s kind of on the run on his own. finally, this movie tries to present a story to us involving the history of both of these creatures, and kings from long in the past, and creates a whole big backstory and legacy for it’s characters. that’s the part of the movie that actually works. 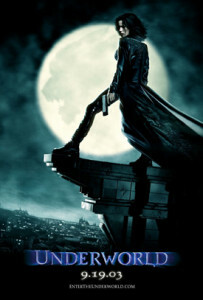 the film starts with kate beckinsale (selene), playing a vampire who is hunting down werewolves. but the werewolves are hunting down something else. they’re after a human. they chase the guy (michael, played by scott speedman) around a subway tunnel, and they bite him, but selene’s attack on them at least helps him get away. michael works at a hospital and he slowly feels strange things happening to his body, and wonders what’s going on. selene, meanwhile, wonders what the werewolves wanted with a human. she tries to tell her fellow vampires, led by a guy named kraven, only none of them believe her, and kraven wants her whole investigation stopped. selene wonders why kraven wants it put down so quickly and starts to suspect that he is involved in something corrupt. she thinks kraven might be working with the werewolves, and so she takes drastic action. wanting new leadership for the vampires and new guidance for herself, she brings back to life an old, dead vampire who is sleeping under the ground and meant to stay sleeping for one hundred more years. that vampire is victor, played by bill nighy, and he’s not very happy to be woken up. on the werewolf side of things, we meet lucian, (played by michael sheen), leader of the werewolves who is indeed looking at michael for a reason. he and his scientist worker have figured out that michael’s blood is unique and might be the key to combining vampires with werewolves. why, exactly, they want to do this, i’m uncertain. the whole thing sounds kind of silly, but we’re meant to just go with it. All of this is in the first half of the movie, and it is by far the weaker part of the film. everything in it seems either cliched or uninteresting. the only moments that show promise are when selene brings bill nighy’s victor back to life. that’s what gets her digging into history and reading books about the vampire legends, and that’s where the movie starts to show Signs of creativity. there’s a legend that kraven killed the werewolf lucian and that’s why he rose up in power the way he did. kraven even brought back a tattooed piece of lucian’s arm, which is now pressed into a book that selene reads through. only she wonders if the whole thing is a lie. she starts to suspect that lucian is still alive, that he and kraven are working together, and that lucian cut the piece off his arm himself and just gave it to kraven to help fool all the vampires. There are a lot of questions and suspicions here. the second half of the movie answers all of these questions and also gives us some back story not only about selene, but also about lucian and victor. we learn of victor’s daughter and of the reasons why he and lucian hate each other. we also learn that selene might have been wrong the whole time about who her real enemy is. the storyline certainly gets sharper as the movie goes on, and characters’ real motivations start to come out. i love the idea that we thought we knew exactly where this movie was going, but the movie had a different agenda up it’s sleeve. the action here isn’t great, but it’s decent. it’s all computerized of course, with giant werewolves running at vampires, but i expected more. maybe the sequels offer more cool action scenes then this one. the movie isn’t great, and takes a while to get going, but it certainly has some cool qualities. the gothic look helps give it style, and i love that it embraces a world and history much bigger than just what’s going on in front of us. the effects and action aren’t great, but that’s probably because this movie is trying to develop a storyline worth pursuing more than anything else. it’s a good sacrifice. by the end of the movie, we feel like we’ve seen a lot and learned a lot about these characters and their pasts. I’m not sure that i need to see any more Underworld movies (there are at least three others), but i’m not opposed to seeing them either.